Composed by Arvo Part (1935-). 20th Century. Set of performance parts. With Standard notation. Composed 1978. 9 pages. Duration 10 minutes. Universal Edition #UE30336. Published by Universal Edition (PR.UE030336). 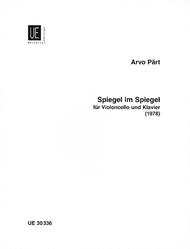 "Spiegel im Spiegel is a well-known example of Arvo Part's Tintinnabuli style and has been used in many films. Spiegel im Spiegel illustrates his creative principles: above a permanent flow of chords on the piano, the cello unfolds a cantilena in long note values, which grows out of succinct steps. This cantilena spins out sweeping, chorale-like arches and spreads itself out more and more. It thus gives rise to a new architectonic configuration which, like a mediation chapel, stimulates reflection, prayer, or the desire for redemption." (Jurgen Kochel). Recibí esta y otras partituras en mi domicilio en África pocos días después de hacer el pedido. Gran calidad de impresión y un precio que era el mejor que encontré después de buscar por internet. Absolutely tedious when practiced for piano alone but a real jewel when cello (or double bass) is added. Very simple to play but requires excellence to be performed well. 21 of 42 people found this review helpful. This is one of the most beautiful pieces of music ever composed. The piano accompaniment can be played by intermediate level pianists IF they are sensitive to meter and nuance. The deceptively simple solo voice is a true challenge. BEWARE: There is a typo in the manuscript. 27 of 50 people found this review helpful.